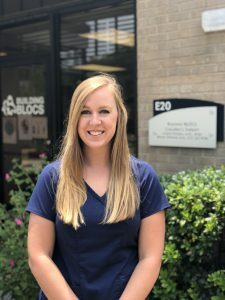 Erin received her Bachelor’s degree from Purdue University in Indiana in 2014 and her Master’s degree in Speech Language Pathology from Our Lady of the Lake University in San Antonio in May 2018. She has a professional background working as an ABA therapist with children birth to school aged. She has additional clinical experience treating and evaluating children with a wide range of communication disorders as well as feeding and swallowing disorders. Erin’s areas of interest include early intervention, autism-spectrum disorders, augmentative communication and feeding intervention. In her free time, Erin enjoys water activities, exploring the amazing restaurant scene in Austin, and most of all playing with her pug, Harold. Erin is thrilled to begin her clinical fellowship with Building BLOCS and is so thankful for the opportunity to grow and learn more in the fields of ABA and speech therapy!